Pressure injuries and documentation are often among the most frequently cited survey deficiencies, and wound care is the subject of continuous research. Most recently, in April 2016, the National Pressure Ulcer Advisory Panel (NPUAP) approved revisions to its Pressure Injury Staging System. 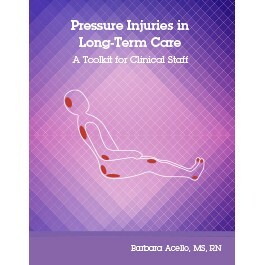 Pressure Injuries in Long-Term Care: A Toolkit for Clinical Staff is full of evidence-based strategies and downloadable assessment tools and in-services to educate your staff about preventing, treating, and assessing pressure injuries. Long-term care is shifting its focus from volume to value, with an emphasis on star ratings that result in increased (or decreased) reimbursement. This resource will help staff overcome documentation problems and better assess wounds and infections, saving time in clinical practice and staff training while avoiding errors that could lead to noncompliance.